PDN has awarded my series ‘People of the Whale‘ in the 2017 Photo Annual. 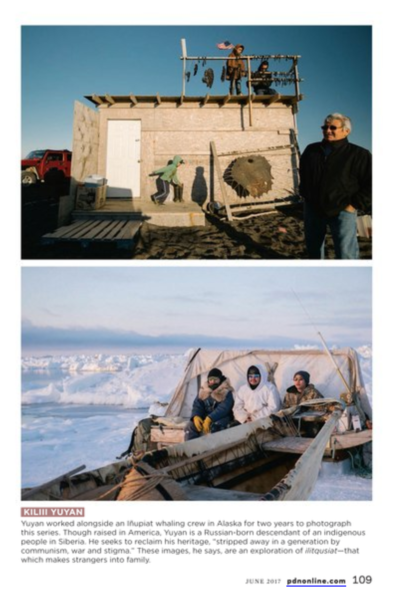 It’s a small set of images that give you a glimpse into the deep community of Iñupiat village Utqiagviq, Alaska. My selection of images for PDN focuses on an Iñupiaq concept called ilitqusiat, or that which makes strangers into family. In a sense, I found this idea to be compelling because I was a stranger when I initially arrived in the Arctic villages where I did this work, but more so because the Iñupiat are at their core, about community. ilitqusiat– (n) that which makes strangers into family. I think if I’ve come away with any single observation, it is that Western cultures have a difficult time even conceiving how deep and different the indigenous concept of community is. Rather than some kind of single collective mind consuming all individual will, the Iñupiat are just individuals that believe in individualism, but whose highest callings are to serve their communities. Qunayaq to all the friends who have made me their family there, and to my ilitqusiat experiences on the North Slope.